Today we have a great guest post from one of our kid bloggers. We first met 10 year old Leilah when she began blogging at Red Converse and Stuff. Recently Leilah decided to start a new blog. This is one of the great things about blogging – you don’t have to stick with your first choice. You can always start a new blog, or change the focus of your original blog so it fits in with the stuff you’re interested in now. So let’s hear from Leilah and find out what she’s learned from starting a blog not once, but twice. Hello, it’s me again.The slightly annoying girl who is the author Of Red Converse and Stuff. My old blog was getting enough views and stuff but I didn’t know what to write, so now I have started an all about blog. The posts are mainly about things that interest me, or amuse me, or just down right confuse me. Soon I will post about the pros and cons about Christmas. Since starting Red Converse and Stuff, I have grown a lot. I know how to guest post, interview other bloggers, and just how to get yourself out there through your blog. Blogging is really good if you want to be the next Roald Dahl or Jacqueline Wilson, or if you just want to make a point. Starting a blog is one of the best things I’ve done. There are lots of blogging formats , but the two most popular are Blogger and WordPress. I chose WordPress because it’s easy and simple to use. If you’re using WordPress (like me) there a wide range of themes, my favourite theme is Itheme2. Post regularly, or people will stop reading your blog. I post every day, but you don’t have to post so often. Make sure to use good punctuation and grammar, people don’t understand your writing if you don’t. If you have Facebook or twitter use them to advertise your blog. Thank you for reading my guest post. Posting regularly is very important to increase the traffic. But It is very hard most of the times because of school works. Hi I have a newish blog could you Please Please come check it out? 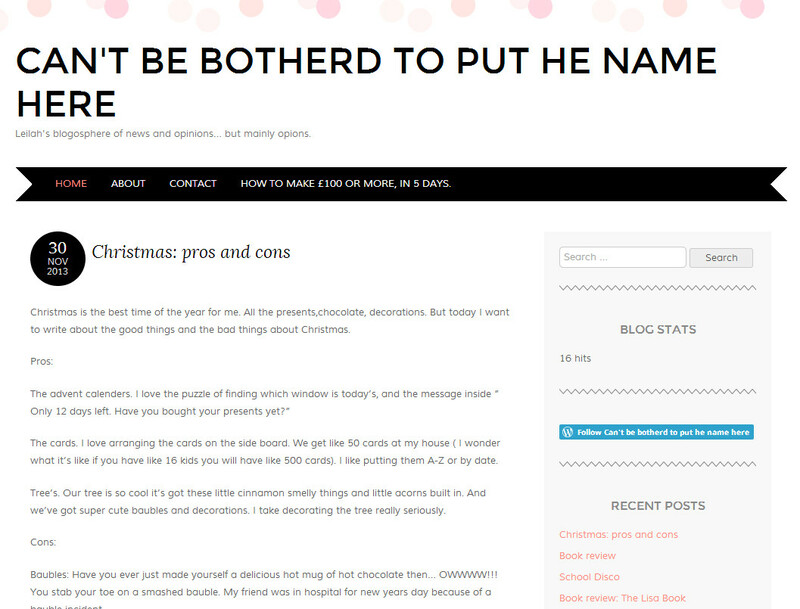 Here’s the link—–>http://connorscreepychronicles.blogspot.com.au/  I’m Not Meaning To milk off this blog, that’s just how it’s done. 6. Make your post interesting. I agree totally with No. 5. I can see that happening on my blog. Awesome advice. The social network one works like a charm. Great Tips! I am sure it will help lots of kids.. I Post one every week then me and my dad check for spellings.